Purchase at Amazon.com to help support Desert-Storm.com. This an an exclusive review of a new book on Operation Desert Storm. As with all aspects of the web site, the goal of this review is to provide an honest and accurate review of the work. In The Unexpected Storm, author Steven Manchester crafts an honest, true to life portrait of America's civilian soldiers, the Reserves, during a time of war. We are invited into the life of Steven Manchester, solider, son, father, and friend. In an act of true courage the author offers a revealing look at his innermost thoughts and feelings. A heart-rending drama from start to finish, The Unexpected Storm, commands the readers attention as well as compassion. From the trials of a tragic loss, to the cruelty and daily life in the desert, to the maddening struggle to repair a physically whole, yet mentally and emotionally weekend man, Steve bears all and holds nothing back. 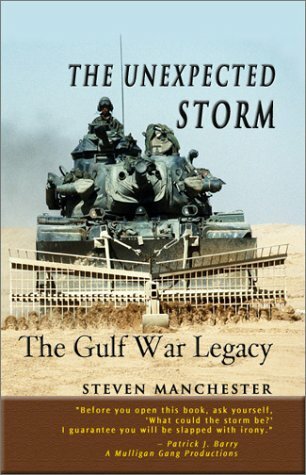 The vivid and heartfelt prose of author Steve Manchester causes the reader to instantly identify with and feel empathy for, the soldiers of the Gulf Theater. At times, tears are barely restrained, at others the reader cannot help but feel the pride and love of a nation for those who are called to serve it. This book will make the hair on the back of your neck stand up, and make you reach deep down inside yourself. This book will touch you on many different levels, from the strictly historical commentary, to the social and psychological commentary, this book is definitely one that you can turn to during any of life's Unexpected Storms. It will teach you the art of perseverance and the art of loving life and not taking for granted the things that are most important. Due to it's highly personal content, as well as smoothly flowing, yet both funny and informational text, I would wholeheartedly recommend this as a must read for anyone interested in hearing the story of the transition from boy to soldier to man, played out during training, deployment, action and post deployment. I just bought the book today. I will give my opinion after I read it.